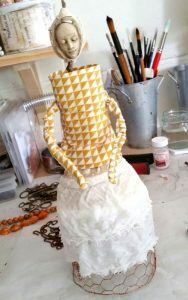 For a while now I have had a longing to create an art doll, I had seen others and thought how lovely it would be to make my own. For some reason though I was not ready, and I hoped that when I was it would be more than “just a doll” – I yearned for it to be connected to me through soul and spirit and for her to be a part of me. I had no idea how to achieve my dream or where to start. Then one day I stumbled upon the concept of spirit dolls. I did my usual google research, didn’t find much at all, but I knew that the time had come to make my doll, and that I would imbue my doll with spirit, mother earth and all those things I hold dear. First I gathered my supplies, sticks, leaves, wire, clay, fabrics, threads and findings. I sat myself down on my meditation cushion and asked my higher self to guide me and for the words and intent that my doll would embody. I wrote in my journal, with my non-dominant left hand, as that is how I have discovered my higher self likes to pass on it’s wisdom…..and it welled up in my heart that indeed “wisdom” was the intent and meaning of this doll. So “Wisdom” was born, she evolved slowly, one step at a time, I followed a process without knowing what would come next, which is very hard for me! I had no fixed plan, not even a vague one, just a few rudimentary ideas, and I was led along on each stage of creating her, one bit at a time. I was scared that I would hate her, be disappointed with her, or mostly myself for my feeble efforts. Perhaps a reflection of ‘real’ life. As it turned out I am enamoured with her. She is a messenger of my inner voice, a talisman of sorts, a reminder that whenever I look at her, and I do that often, or feel her presence, that I am anchoring the wisdom of my own higher self and it’s knowledge and understanding. She was born of life, so Mother Earth provided a stick that became her body, she then received arms with some fencing wire, and a skirt of chicken mesh, a smaller stick formed her neck. I hoped to use natural materials as much as possible. Torn cotton fabric created her body mass and head. I made little faces with various clay and molds, then fiddled with them to give her the character I desired. She received another layer of fabric (which was soaked in fabric hardener), inside her chest are tucked a little shell heart and a torn piece of a letter my father wrote me as a child – I lost him early in my life so his words and presence are always with me. Her face was chosen, more by her than me, it spoke to me with it’s gentle kindness and serene quality. Her dress, well I made it up as I went, she guided me to the frilly skirt, but that was tempered with the geometric top, a wise woman indeed, balance in everything, walk the middle road. 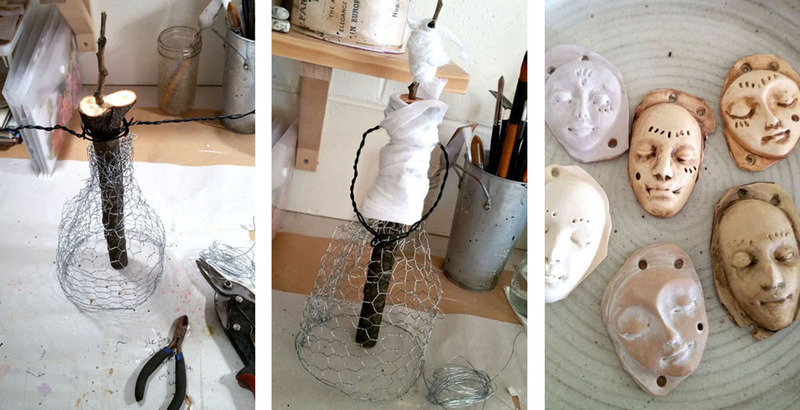 The bottom of her skirt, the chicken wire, is now coated with copper paint. Again her hair came about organically, I had to use what I could find, and the raffia and leather cord worked perfectly, she has a regal yet earthy and casual quality about her. 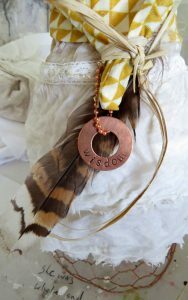 I hand stamped her name and message on a copper washer and then added a feather from my collection, feathers are one of my favourite things on this earth. She gently clutches them both within her clasped hands in front of her, a constant reminder of what is important in this life. Over her heart hangs a symbol of what hides inside. She wears her heart on her chest. I love her more than I can say, and that is because she is a part of me. A big part. The best part. Over the last few years I have learned to love myself (pretty much) fully. I now feel that deep love directed towards Wisdom, who is me. We are one and the same. As I meditated on the process after completing her I knew that she was in essence my higher self, that I had created a physical representation of my highest self, as a constant reminder for those times when I become so immersed in the physical world that I forget my true Self. Toni, Your post is simply beautiful. As I posted on Facebook, I would love to see this in action, yet it would be quite difficult to do a class, as it is so individual. All the supplies come from ones own imagination, and heart. Which you’ve displayed so perfectly. Thank you for sharing your journey with all of us. But, recording the process, YES! I’d love to see this! You’re simply amazing, heart and soul. Much love, and light to you my sweet friend. ? Tara you always have just the right things to say, thank you my friend. I am thinking on how this could be presented as a class, probably more the process, and he individual elements that go into it rather than the specifics, because as you say, each one would be an individual journey of the soul. It’s always a pleasure to talk with you, about your work, as it so touches me, and my soul. Thank you so very much. You’ve actually given so very much, with this post. The rest is up to each of us, to take, to learn. But if you do a project post, please let me know! I’d love to see it! ???? Toni your spirit doll is just perfect, the feelings that you got from her and the love that you put into her creation is so special. 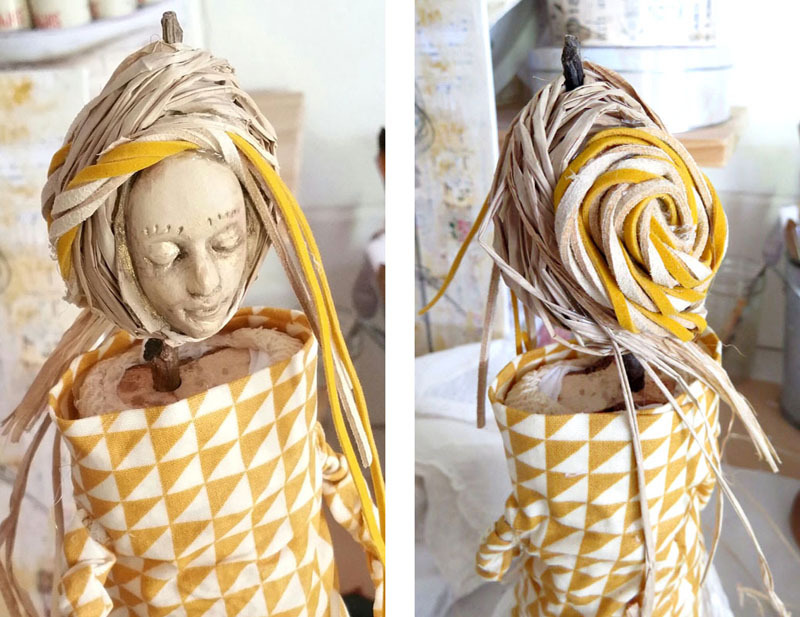 I enjoyed reading your process and understanding what a spirit doll means to you. I’m so glad that we are friends, I look forward to seeing what you are creating!! ((HUGS)) to you my friend. Toni, this has to be the most beautiful post I’ve read in awhile. You are such an inspiration to me in more ways than you know. 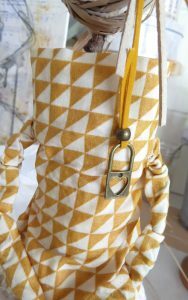 I love the details of your story and bringing your doll to life, thank you for sharing. 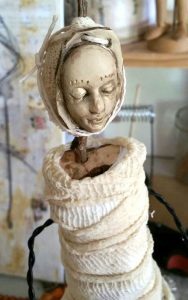 As others have already commented I’ve also been wanting to create my own doll will see where the journey to bringing her to life takes me…….keep creating my friend love you love your work! She is amazing! And you are so honest about your art and giving! ? Cheryl I’ve always been an honesty girl, just kept it inside most of the time, I am enjoying the sharing, and thank you for your continuing support my friend. Truly amazing, I love all the details and meanings. Love her message and her serene look. Thank you Jenn, I am mesmerised by her face and her serenity, I hope to emulate it. Found your post on IG and followed the path to your blog. Love the passion and joy that you inbued your spirit doll with. 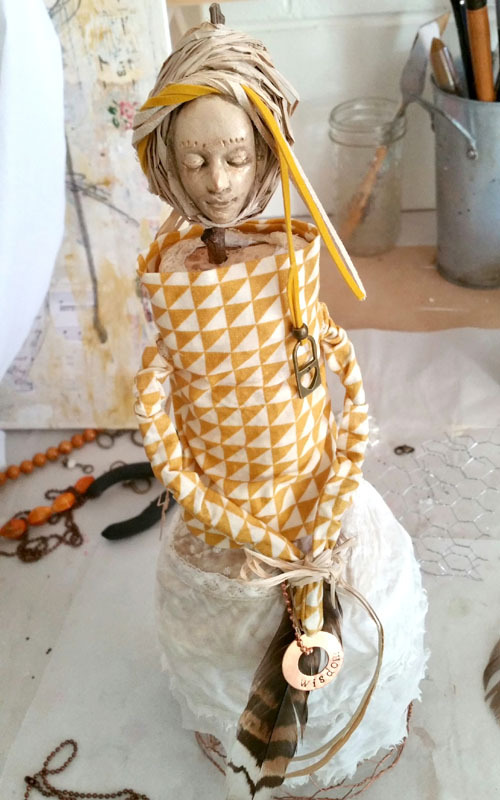 I have loved dolls and especially one connected to your spirit and created with your artistic energy. She’s beautiful Toni and thank you for sharing your journey to her !! I am always drawn to the “stories ” behind the art. When I see something I love at a gallery or show I ask about the story it tells. Art is such a part of the artist ??? I have the same yearning, have always loved dolls. Thinking maybe at some point I will be compelled to create my own. Thank you for sharing your heart. Beautiful story Toni and incredible doll. This is so individual that I can’t imagine a class now that I read and saw. It does inspire me to look deep and perhaps try my hand at a doll that speaks to my inner self. Thank You for the inspiration – as always.